I’m trying to get back into the swing of things while I still have some small measure of 2016 left to me to write. Nothing like starting out on the right foot for a new year. My annual feature, Comics That Challenged Me, will be starting next week and will run through the holidays. 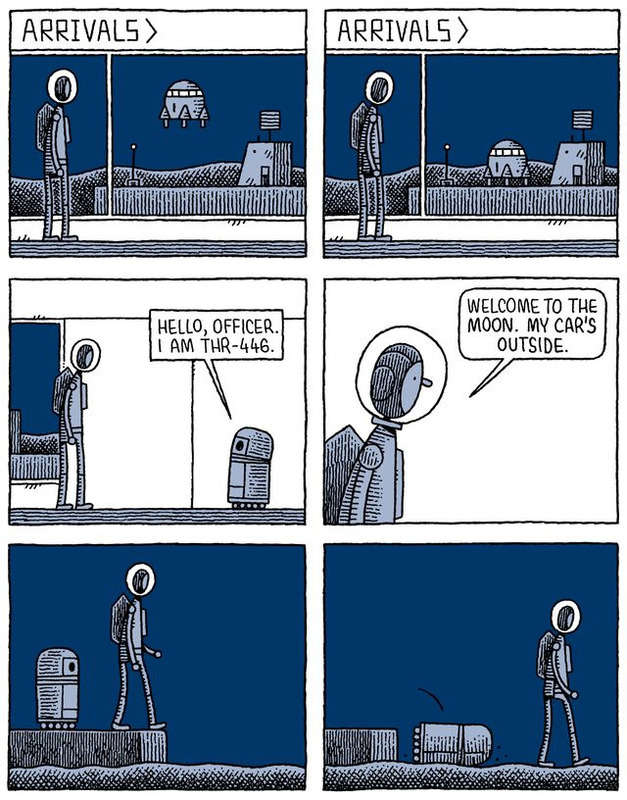 I’ve been following Tom Gauld’s work for the New Scientist and the Guardian, so I was enthusiastic to see that Gauld had a new novella-length comic coming out from D&Q this September. 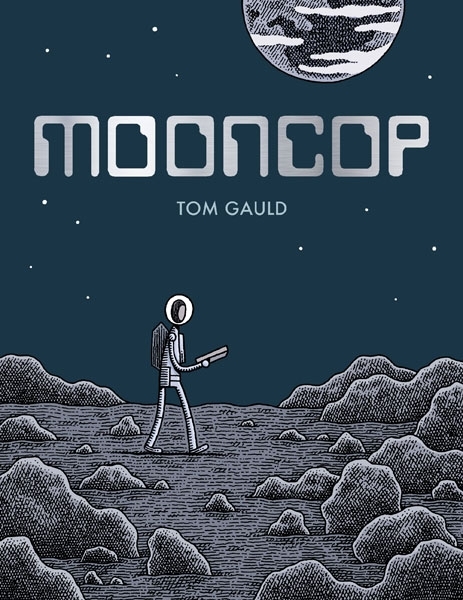 I just recently finished Mooncop, which features the only law enforcement officer on a dwindling lunar colony, and that officer’s slowly growing dissatisfaction with his work and his life. There’s something retro-futuristic about Mooncop – the audacity of imagination that there one day could be an actual moon colony feels novel at the end of a brutal 2016. But it also feels like the future of the past, with bubble helmets for every person, creature, and plant. 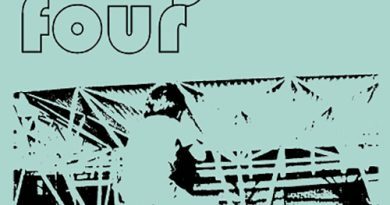 The font of the title looks like something off of a 1970s matrix-dot printer. It’s a clever setting, because there’s something even more heartbreaking about a dilapidated, fading utopia than there is about a dystopia. 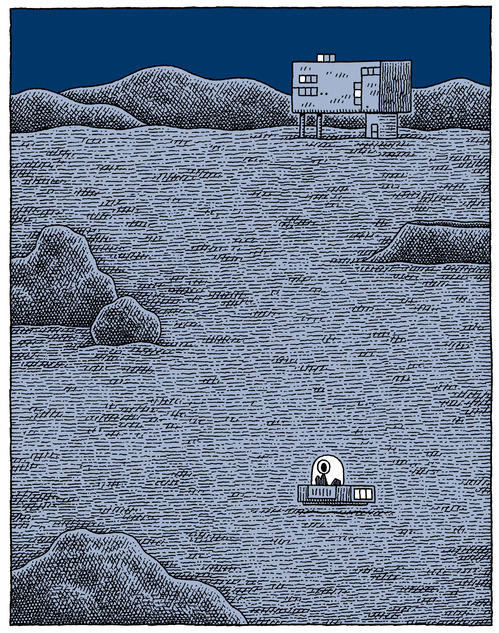 It’s clear that in Gauld’s Mooncop future, the hubbub of this lunar colony is long-since past. Capsules are cracked, buildings are in disrepair, and everyone is packing up to head back to Earth. The moon cop has no crime to fight, no mysteries to solve, and generally fusses with relatively trivial things like finding lost dogs and retrieving runaway children. Zero crime means a 100% crime solution rate, which looks nice, but masks the disillusionment of having a placeholder job without any purpose. That melancholy seeps out of the book. Gauld also seems to have a nostalgia for the future past. It’s an interesting mix. 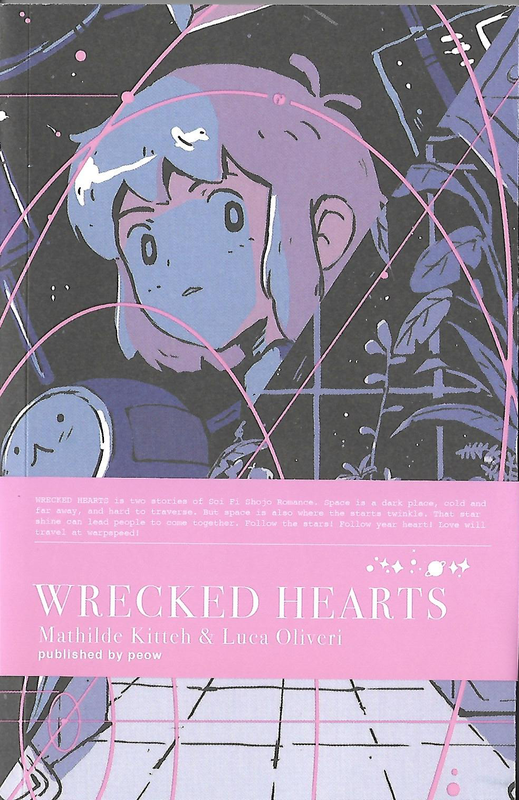 Besides the main character’s escalating discontent, Gauld picks at technological advancement – the Lunar Donuts module where the hero gets his morning donut and coffee (because of course, even in the future, cops love donuts and coffee) is thrown in the garbage to be upgraded to a mini-cafe.The tech in Mooncop is constantly on the fritz, whether that’s the agency-mandated therapy robot, the lunar donuts module, or the Neil Armstrong automatron from the Moon Museum. 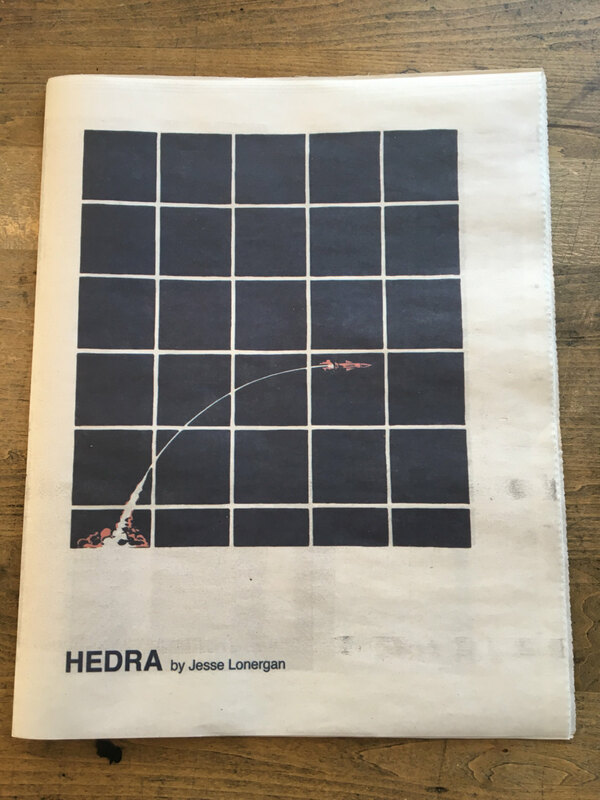 Outside of the relative merits of Mooncop, which I found to a funny, lovely book, I’m fascinated by the time and place in which I read and evaluate this work. 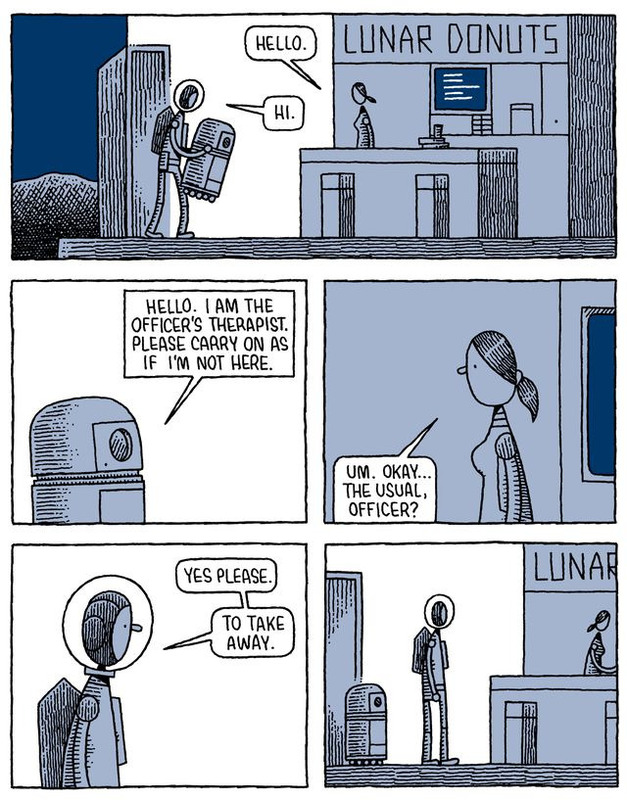 Had I read Mooncop in September when it was released, I likely would have found it a wry and prickly comedy about human nature, the nature of bureaucracy, and the advancements of technology. But in December 2016, Mooncop feels like a lost future, and Gauld’s nostalgia seems much more keenly realized for me. Whether you read Mooncop in September 2016, December 2016, or read it in December 2116, Gauld incisively points out that no matter how lovely, broken, or strange the world humanity has created, that same humanity will always have its melancholy and its foibles. It will always look for something bigger, or more. Sometimes, it won’t find it; sometimes it will. Sequential State is supported by readers like you on Patreon. If you liked this review, please help us out!